BiblicalEthic.org - Hobson's Biblical Choice Blog - Did We Take Out "Plain and Precious Teachings"? Is the Book of Mormon’s charge true? Who chose the books of the Bible? And what got left out, and why? Contrary to the claims of The Da Vinci Code, there was no top-down decree or official vote on the books of either the Old Testament or New Testament. 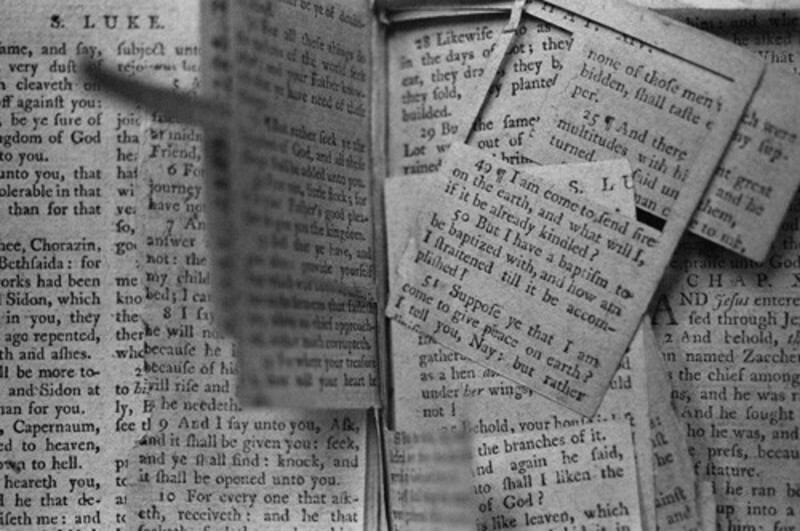 The identification of which books were God’s word was a grassroots effort, a process that took place over time. There are two ways we can tell which books people believed to be authoritative. One way is by popular usage: which books keep getting used or quoted as the word of God. The other way is when people make official lists, which at least give us the opinions of the people who made the lists. For the Old Testament, Protestant Christians have simply accepted the unanimous Jewish opinion on which books were Scripture. The Catholics and Orthodox also accept the books that were included in Greek copies of the Old Testament, which the Jews never treated as sacred. There is much more that could be said, but there was nothing sneaky about the process. The consensus around 180 AD about the New Testament canon (as we see in a text called the Muratorian Canon) was very close to what appears on canon lists in the late 300’s (the lists in the late 300’s are where we get the list we have today). If anything, the early church before 300 AD leaned toward leaving out books that we have included. A lot of early writers never quote James or 2 Peter. The list from 180 AD leaves out Hebrews, James, 1-2 Peter, and 3 John, plus it includes Wisdom (from the Old Testament Apocrypha!) and the Apocalypse of Peter (although the writer says some will not allow it to be read in church). So, how did the early church decide what books could be trusted? For instance, how did they narrow it down to four Gospels and no others? We owe a tremendous debt to Christians who lived around 70-100 AD. They were the ones who could still remember what Jesus said and did, so they were in the position to know which books told the truth about Jesus. Luke was probably a major player in collecting these books. The early church used four criteria to determine what belonged in their Bible: 1.Apostolicity (did it come from an apostle or someone close to the apostles who preached the same message?). 2. Antiquity (is it old enough to really go back to the apostles?). 3. Orthodoxy (does it fit with what we already know is true about Jesus?). 4. Usage (is everybody quoting it?). Notice that the four Gospels are anonymous (there are no names in the text themselves – these books didn’t need titles to prove that they were apostolic), while the fake books relied on name recognition, which still failed to win acceptance for Peter and Thomas. An apostolic name on the label was no substitute for content; if the content is junk, so is the name on the label. Pseudonymity (writing under false names) was a unique issue for Christians, because it impacted apostolicity. If a book claims to have been written by Peter or Paul, but it wasn’t, it’s not apostolic. The early church was not gullible. They were slow to accept 2 Peter as genuine, and many did not accept the Epistle to the Hebrews on the grounds that they did not believe it was written by Paul. But Hebrews never claims to be by Paul. I believe that it was written by Apollos of Alexandria, a guy who hung out with Paul and preached the same message. So if we had locked in the New Testament canon around 200 AD, not all the books we have today would have made the cut. But early believers were unanimous in rejecting almost all of the books that never made it into our Bibles. This was not a top-down decree from some ruler or council. It was a grassroots effort, a process over time in which the whole group participated. So who got cut out of the New Testament by the earliest believers, and why? There are 2 categories of books that did not make the cut. The first category is the books that were considered to be false teaching or heretical, which includes the so-called Gnostic writings. These include the Gospel of Peter (where Jesus stomps out of his tomb with his head in the clouds), the Gospel of Thomas, the “Infancy Gospels,” the Gospel of Mary, the Gospel of Judas, and the second Apocalypse of Peter. By the way, the Gnostic writings were not suppressed, as Bart Ehrman and Dan Brown would have you believe. The content of these books has been an open secret for over 1,800 years. Early Christians would yell, “Bad book! And here’s what it says!” So when 46 Gnostic books were unearthed at Nag Hammadi, Egypt, we found that the early church was telling us the truth about these books that they allegedly suppressed. So Bart Ehrman is wrong when he claims that the Gnostics were victims. He thinks the early church probably had what we would call heretical beliefs, and that we “won,” not because we were right, but because we had the muscle to stomp out our competitors. No, the Gnostics were not oppressed underdogs; they were elitists. Both the Gnostics and the orthodox would have rejected the idea that both of them could be right. And nobody was in the position to force one conclusion or the other down anyone’s throats. Grassroots believers decided that the Gnostic books were bogus as a source of truth about Jesus. So what was wrong with these books, then? The Gnostics believed that the material world was evil. They believed there were 2 gods: the evil creator God of the Old Testament, and the New Testament god of sweetness and light. Marcion (140 AD) was one of the first famous teachers of this heresy, although Gnosticism was already well under way in the 90’s, if not earlier. Marcion and the Gnostics threw out the whole Old Testament, and Marcion did a chop job on the New Testament as well, leaving only a mutilated copy of Luke, and 10 letters of Paul with everything Jewish cut out of them. The Gnostics believed that Jesus was just a ghost. He appeared to be human, but he was not part of the material world. The Gnostics believed they had secret teachings of Jesus to help them rise above the material world. In earlier books, like the Gospel of Peter and the Gospel of Thomas, the weird teachings are comparatively mild, but as time went on (past 200 AD), Gnostic teaching got more complicated. The Jesus of the Infancy Gospels is a holy terror who pronounces fatal curses on any playmate who crosses him up. In the so-called Acts of John, Jesus never left footprints. In the 2nd Apocalypse of Peter, the speaker sees someone nailed to cross, and someone above the cross, glad and laughing; the one who is glad and laughing above the cross is the living Jesus, and the one on the cross is just a substitute. The point is that Christians could tell this was a very different Jesus than the one found in the books they could trust. No less an LDS authority than apostle James Talmage agrees that they were false. The other books that didn’t make the cut were good books that came along too late to make the publication deadline. These books show us what the early church really believed. There is nothing off-base or bizarre in them, but there is also nothing essential in them that is not already found in the Bible, and the authors are not apostles who lived in Jesus’ day. So the guy who wrote the list in 180 AD says that the Shepherd of Hermas is a good book, but it’s too recent to be an authority for their faith. Other such books include 1-2 Clement, the letters of Ignatius, Barnabas, and the Didache, all written from 95-130 AD. Were there LDS books that were suppressed? There is no trace of these, and from what we have seen, such books would have been extremely hard to extinguish if they had existed. The Book of Mormon claim that plain and precious elements were removed from God’s word is unsubstantiated, both on the level of which books were included, and on the level of the text and translation of the books that the Nicene and LDS churches both accept. We’ll take a look at that subject in my next post.